Roughly a third of our home was unusable because of the clutter and chaos. Also – there are no pictures of any room at it’s worst. and these pictures are how we lived when no one was looking. I would have never let even family who didn’t live with us see these rooms like this. We were very, very good and stashing and dashing. closets bursting at seems – comments about having a lot of stuff but never would I show anyone this. Here is picture 2 – our plant is no longer with us. We’ve had this neglected plant for almost our whole marriage. I didn’t want to get rid of it but also didn’t want to keep it. plant and stand were sold at one of the yard sales this summer. bookshelf given to my brother. I imagine many items pictured are no longer in our home. Our vacuum cleaning not put away but near the walkway so we can get to it. a solitary dress on a garment rack. nothing goes together and it’s all chaos. We have this gorgeous furniture set – my husband’s computer desk and matching book shelf. beautiful set – was a yard sale find. We obviously don’t take care of it. it’s loaded down with too many items. red bins on top full of stuff, piles everywhere. Closet (taken in March) – kitchen set sold. sewing box sold. pink box full of motivation/ improvement audio CDs – donated to my work. Will show updated pictures of the closet soon. Now for some pictures I took about 10 minutes ago – I’ve been wanting to wait until it was “perfect” but I don’t really want to wait anymore. I spent about 10 minutes straightening up before taking these pictures. This first picture is what you see when you are looking into the room. I’ve been going through things and decided that I’m separating out by who needs to make the decision to keep or get rid of. The bright green bucket on the desk is my daughter’s items, the green tote underneath is my husband’s and the black (hunger games) bag next to it is mine. The black cauldron still holds Halloween candy and once it’s empty will join the Halloween decorations in the shed. The bag next to the desk is full of empty bags that were full of stuff. 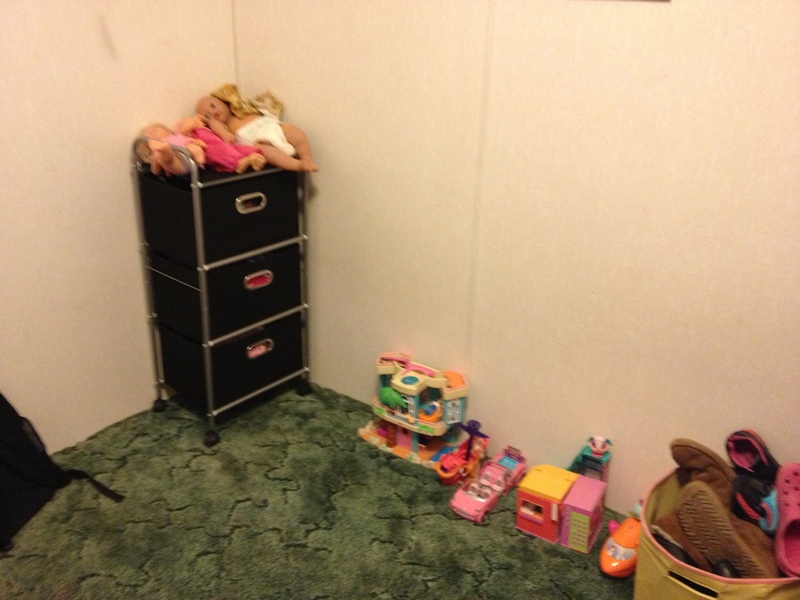 The tall white totes next to the couch (2 of them) were full of stuff – now empty. Game shelf still full but not overflowing anymore as we purged a bit of games. Here is the tv from our bedroom – move to the family room so I can eventually exercise in here with the Wii fit and the Kinect. Also – here is the printer stand and game shelf that was previously in the living room. really cord heavy but eventually we will make it more attractive. my husband’s bowling ball that he has yet to put away in the closet. some totes chilling where they don’t belong – empty green tote, white tote has yard sale items, gray tote next to it has our winter stuff – hats, gloves, scarves, boots, coats, etc., large gray tote has my daughter’s toys that she isn’t ready to part with but doesn’t fit in her room – going to the shed until she is ready to part with them or wants to switch out her toys. white box full of empty bottles for homemade laundry soap and fabric softener to give away. bag is full of stuff I still need to sort through. The picture below was not taken tonight but gives you a good idea on how it’s looking now. my husband has decided to sell these two pieces of furniture which means we have to decide what to keep and what to get rid of. red baskets still full of stuff. shelves have less books than before. those plastic shoeboxes are full of art supplies that we actually use. he is also taking about selling his computer and buying a laptop. I wanted to share the dryer balls my husband and I have been making! still need to be felted. My living room – the update! We kept the PS3 in this room so we can watch netflix and movies. I liked the bins so much in my daughter’s room that I bought one for the living room. I chose not to put the top two baskets in so that I could use the shelves as a place to display my favorite Christmas decorations. I could never be a minimalist with no Christmas decorations but I did realize that I also don’t need four totes full. Usually our living room is plastered with holiday stuff to where it’s overwhelming. not so much this year. As you can tell there is quite a bit less here than before. 7 of our favorite Christmas decorations are on the two shelves but my snowman sitting on the floor next to Jack’s bed. The PS3, two controllers, tv controller and surge protector make up the other items pictured. Want to know what’s in the basket? Two Christmas collection DVD sets for easy access! 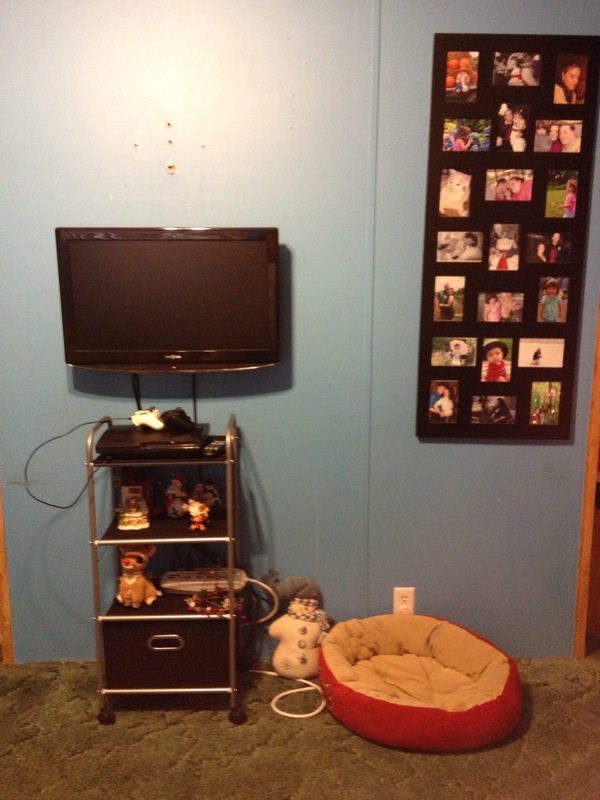 Hanging on the wall is my TV and my picture frame. It seems cord heavy in the picture but we will have to make due. Second view – our Christmas tree full of ornaments and a newly aquired tree topper to replace our beloved but broken tree topper. 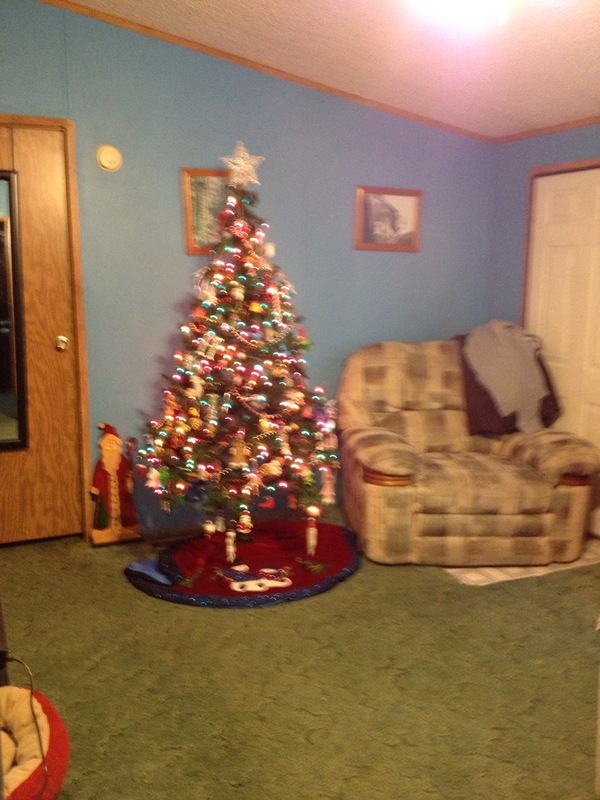 our snowman tree skirt, a wooden santa, our recliner with my husband’s sweatshirt and coat. Two pictures hang on the wall – will be moving them to a better location eventually. Hidden behind the recliner are two folding tables for when we have parties for my daughter. This is what you see when you walk into our living room. 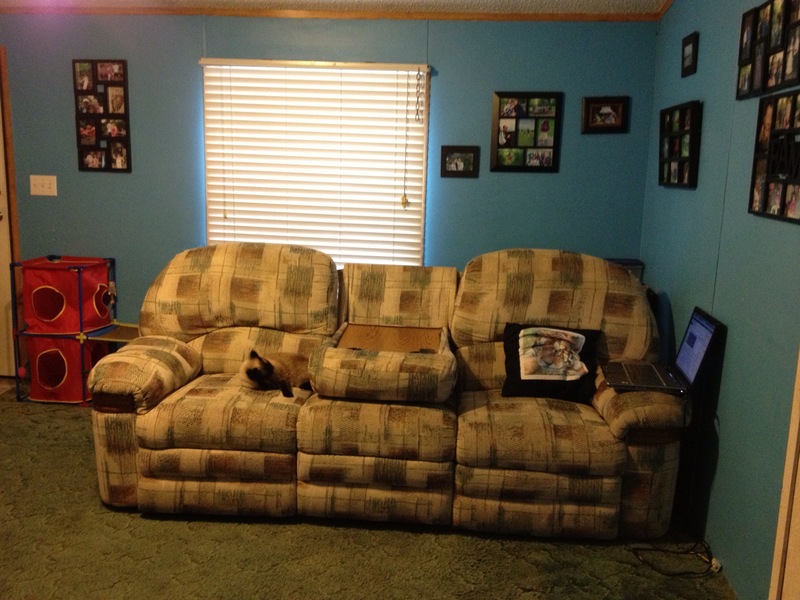 our couch was moved because my husband wanted to see the tv better so it no longer rests flat against the wall. my laptop and a tiger pillow on the couch and my cat sleeping. 9 pictures hanging on the wall and blinds but nothing hanging from the ceiling anymore. Our cat’s tower against the wall. 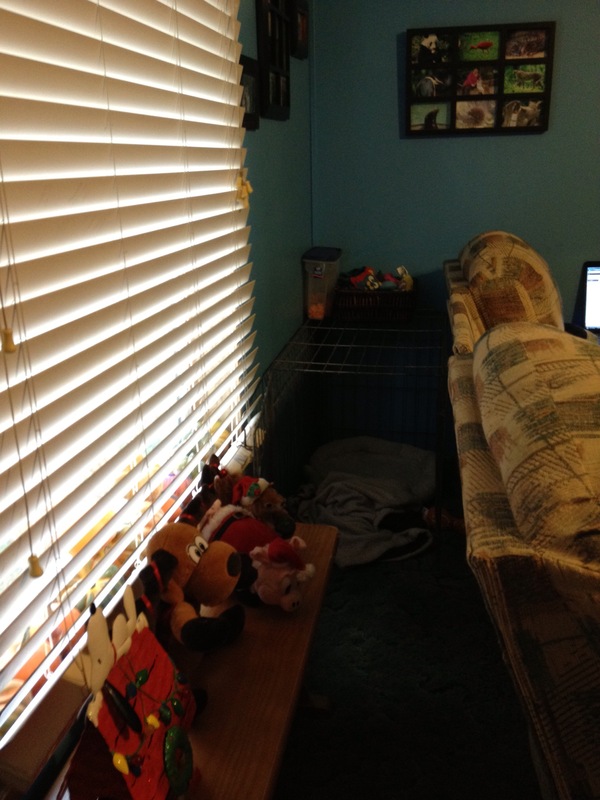 behind the couch – jack’s crate with his blankets, toys and treats. Our bench to the kitchen table and 4 of my daughter’s favorite toys for Christmas. Hidden on the window sill are about 15 acorn squash and mini pumpkins. I’m going to have to throw these in the woods soon as they will be rotten before long.